Justin Forsett (born October 14, 1985) is a former American football running back. He played college football at California and was drafted by the Seattle Seahawks in the seventh round of the 2008 NFL Draft. Forsett also played for the Indianapolis Colts, Houston Texans, Jacksonville Jaguars, Baltimore Ravens, Detroit Lions, and Denver Broncos. Forsett's best season came in 2014 as a member of the Ravens, when he was selected as a Pro Bowl alternate after finishing the season with career highs in carries (235), rushing yards (1,266) and touchdowns (8). Forsett was born in Lakeland, Florida. He moved to Arlington, Texas in his sophomore year of high school after living in Mulberry, Florida. Forsett attended high school at Grace Preparatory Academy in Arlington, where he played football, basketball and ran track. In football, he set several school records. In his final two seasons, he had 63 touchdowns and rushed for nearly 5,000 yards, leading Grace Prep to two Texas Association of Private and Parochial Schools division 4A state championships. In high school, his nickname was "The Truth". His father Rodney is a minister and a coach. Forsett plays the tenor saxophone and taught himself a little piano. He lists video games and photography as his hobbies. Reggie White is his biggest inspiration. In track & field, Forsett competed in sprints and relays during his final two years at Grace Prep. As a senior, he recorded personal-best times of 11.07 seconds in the 100-meter dash, 23.3 seconds in the 200-meter dash and 54.1 seconds in the 400-meter dash. At the 2004 TAPPS State Championships, he ran the lead leg on the Grace Prep 4 × 100m and 4 × 200m squads, helping them capture the state title in both events with times of 43.13 seconds and 1:30.97 minutes, respectively. Close to signing day, Notre Dame pulled a scholarship offer from Forsett. Notre Dame coaches later contended they had not offered Forsett a scholarship. Notre Dame's running backs coach at the time, Buzz Preston, later said that Notre Dame was looking for a taller running back. The Texas Longhorns decided not to offer Forsett a scholarship because of his size. Forsett's coach Mike Barber, a former NFL player, distributed Forsett's game tape to colleges across the country. Coach Jeff Tedford offered Forsett a scholarship after watching Forsett's game tape and receiving a tip from Cal great Chuck Muncie, and made Forsett one of the last signings of Cal's 2004 recruiting class. With a deep depth chart at running back, it appeared Forsett would redshirt his freshman year, but an impressive performance in fall camp kept him on the active roster. In the season opener, Forsett had 34 yards rushing and a touchdown in Cal's victory over Air Force. Forsett played mostly as a backup during his first three years behind J.J. Arrington and Marshawn Lynch. Nevertheless, he managed to amass a good amount of playing time. During his freshman year, Forsett was used primarily on special teams, returning one kickoff for 11 yards but usually blocking for Marshawn Lynch. On coverage units, he made 3 tackles and blocked a punt in the endzone for a touchdown against Washington. During his sophomore year, Forsett became second on the Cal depth chart at running back. He filled in when Lynch was injured in the early season and ran for 235 yards against New Mexico State, good for the fourth highest single game rushing effort in school history. In Forsett's junior year, he continued his role as backup. He ran for over 100-yards against Oregon when injuries sidelined Lynch and in Cal's rout of Texas A&M in the 2006 Holiday Bowl. As a starter his senior year, Forsett rushed for 1,546 yards on 305 carries, and scored 15 touchdowns. He opened the season with 156 yards rushing and a touchdown against Tennessee. His 15 touchdowns led all rushers in the Pac-10, and his 1,546 rushing yards finished second, behind Oregon tailback Jonathan Stewart. Forsett's efforts earned him a selection to the All-Pacific-10 Conference first team. Forsett ended his college career on a high note, rushing for 140 yards and 2 touchdowns in a 42-36 Cal victory over Air Force in the 2007 Armed Forces Bowl. Forsett with the Seahawks in 2009. Forsett was drafted by the Seattle Seahawks in the 7th round in the 2008 NFL Draft. He scored his first NFL touchdown on August 16, 2008 in a preseason game against the Chicago Bears, during which he also gained 261 all purpose yards, with 136 rushing and 125 return yards. The total was 55 yards more than the entire Chicago Bears' offense for the night. One game into the regular season, Forsett was waived by the Seahawks on September 5, 2008. A day after being waived by the Seahawks, Forsett was claimed off waivers by the Indianapolis Colts on September 10, 2008. He was waived on October 8. A day after being waived by the Colts, Forsett was re-signed to the practice squad of the Seattle Seahawks on October 9, 2008. Forsett was then signed from the practice squad on October 14, 2008 and became the return specialist. For the 2009 season, he was slated to compete with Julius Jones and Edgerrin James for touches in a crowded Seahawks backfield. After the release of Edgerrin James, Forsett became the teams No. 2 back which gave him an opportunity to get more touches and make a bigger on-the-field impact. On November 15, Julius Jones, the starting running back for the Seahawks, left a game against the Arizona Cardinals with a bruised lung. Forsett filled in for Jones, rushing for 123 yards and his first regular season touchdown. He started as the primary running back on November 22 game against the Minnesota Vikings, scoring his second touchdown on a 9-yard run. With the Seahawks' running game struggling, Forsett also caught 8 passes for 80 yards. On November 29 against the St. Louis Rams, he rushed for a career-high 130 yards and two scores. With the return of Julius Jones in week 13 against the San Francisco 49ers, Forsett was relegated back to the position of 2nd-string running-back. He saw only 8 touches, rushing for a net gain of 9 yards, reception of 25 yards, and one touchdown. When asked if Forsett will be elevated to the position of the primary running back for the Seattle Seahawks, Coach Jim Mora responded,"You'll see them both and we like them both." But Mora confirmed that Forsett will see more touches, "Are we going to see more of Justin? The answer is yes, absolutely." In the 2010 season, Forsett had 523 yards on 118 carries, with 2 touchdowns. In 2011, Forsett was only able to amass 145 yards on 46 carries, with 1 touchdown. The Seahawks did not re-sign Forsett after his contract expired following the 2011 season. Forsett signed with the Houston Texans on June 2, 2012. In the Texans' final 2012 NFL preseason game, played against the Minnesota Vikings, Forsett broke Arian Foster's preseason record of 110 yards rushing. On Thanksgiving Day, November 22, 2012, Forsett scored an 81-yard touchdown, the longest running play in Texans history. Replays showed that Forsett was down by contact before making a first down, but the play was not reviewed due to Lions coach Jim Schwartz throwing the challenge flag on an automatically reviewable scoring play. Forsett has admitted he was down by contact. The Texans would eventually win the game against the Detroit Lions in overtime 34-31. Forsett signed with the Jacksonville Jaguars on March 15, 2013. He was placed on injured reserve on December 9, 2013 due to a foot injury. He was released on March 11, 2014. Forsett signed a one-year deal with the Baltimore Ravens on April 4, 2014. Initially signed as a likely third stringer behind Ray Rice and Bernard Pierce, Forsett was thrust into the starting role at the beginning of the season due to the suspension and subsequent release of Rice, and injuries to Pierce. Forsett performed well enough to keep the starting job even after Pierce was healthy again. In the 2014 season opener against the Cincinnati Bengals, Forsett carried the ball 11 times for 70 yards and rushed for a touchdown, which was the first of the Ravens' season. He also caught 5 passes for 14 yards. Despite Forsett's decent debut, the Ravens lost 23-16. In Week 4 against the Carolina Panthers, Forsett carried the ball 14 times for 66 yards and a touchdown. He also caught three passes for 31 yards. The Ravens blew out the Panthers 38-10. In Week 5 against the Indianapolis Colts, Forsett carried the ball a mere 6 times and ran for 42 yards. He also caught 7 passes for 55 yards. Forsett scored the Ravens' only touchdown of the game on an 11-yard rush. In Week 13, the Ravens played the San Diego Chargers. Forsett passed the 1,000 rushing yards mark for the first time in his career. He carried the ball 24 times and ran for 106 yards. In Week 14, Forsett carried the ball 13 times for 71 yards and a touchdown. He also caught 2 balls for 7 yards, as the Ravens beat the Miami Dolphins 28-13. In the season finale, the Ravens played the Cleveland Browns. They won 20-10 and clinched the final playoff spot in the AFC. Forsett contributed to a good ground game, carrying the ball 17 times for 119 yards. He also caught 2 passes for 17 yards. In the Divisional round of the playoffs, against the New England Patriots, Forsett carried the ball 24 times for 129 yards. He also had 2 receptions for 17 yards, including a 16-yard touchdown catch. Forsett finished the season with career highs in carries (235), rushing yards (1,266) and touchdowns (8). He fumbled one time, and recovered it. He also caught 44 passes for 263 receiving yards. He also played in the 2015 Pro Bowl as an alternate. On March 12, 2015, Forsett re-signed with the Ravens on a three-year deal worth $9 million. In the Ravens season opener against the Denver Broncos, Forsett had a 20-yard fourth quarter run to put the Ravens in position for a game-winning touchdown. However, they could not capitalize and lost the game. In Week 2, Forsett ran the ball 15 times for 68 yards in a 37-33 loss to the Oakland Raiders. Forsett broke out in a Week 4 Thursday Night Football matchup against the division rival Pittsburgh Steelers, running the ball 27 times for 150 yards and helping the Ravens win their first game of the season. The next week, Forsett ran the ball 21 times for 121 yards and scored a touchdown, as well as catching four passes for 49 yards, but the Ravens lost to the Cleveland Browns. Forsett ran for 62 yards the following week against the San Francisco 49ers, scored the opening touchdown in a primetime game against the Arizona Cardinals, ran for 69 yards against the San Diago Chargers and had 53 yards against his former team, the Jacksonville Jaguars. The Ravens won only one of those games. In a Week 11 game against the St. Louis Rams, Forsett suffered a season ending broken right arm after he was picked up and slammed down by St. Louis defensive end Aaron Donald. On November 27, 2015, he was placed on injured reserve. Forsett finished the year having played and started 10 games, rushing 151 times for 641 yards and two touchdowns. On September 3, 2016, Forsett was released by the Ravens. Two days later, Forsett re-signed with the Ravens but was released again on October 4, 2016. On October 11, 2016, Forsett was signed by the Lions. He was released by the Lions on December 3, 2016. He appeared in two games for them and had 13 carries for 38 rushing yards. Forsett was claimed off waivers by the Broncos on December 5, 2016. This reunited him with Bronco's head coach Gary Kubiak for the third time in his career with a third different team. He previously played for Kubiak under the Texans and Ravens. On December 11, 2016, he made his debut for the Broncos and finished the 10-13 loss to the Tennessee Titans with six carries for 17 rushing yards and three receptions for 18 receiving yards. On May 3, 2017, Forsett announced his retirement from the NFL. Forsett stated through social media: “I’m officially announcing my retirement from the game I love. It’s been an amazing ride and I’m grateful for every moment. My career has brought so many great people into my life, and I asked some of them to join me in saying goodbye.”  Forsett completed his NFL career with 3,890 rushing yards, 1,351 receiving yards and 20 total touchdowns. He retired as a Baltimore Raven. Forsett had an idea in college for a "shower pill", and after retirement developed the product as well as complementing products and signed fellow players Jonathan Stewart, Steve Smith Sr. and others to invest in the brand. Forsett is featured in the final episode of Long Shot along with Chad Johnson and Larry English. In 2017 Forsett joined the Ravens' radio broadcast crew, to serve as a color analyst for four regular-season games. In the summer of 2018, Forsett was co-captain and a player for Godspeed, a flag football team made of former professional American football players that participated in the American Flag Football League (AFFL). The team were crowned the champions of participating pro teams but lost in the final match to the amateur champion team. ^ Rosenthal, Greg. "Ravens' Flacco (torn ACL), Forsett (arm) out for year". nfl.com. NFL. Retrieved November 23, 2015. ^ Downing, Garrett (September 3, 2016). "Ravens Trim 2016 Roster to 53 Players". BaltimoreRavens.com. Archived from the original on September 3, 2017. ^ Hensley, Jamison (October 4, 2016). "Ravens to release RB Justin Forsett". ESPN.com. ^ "Lions sign free agent RB Justin Forsett". DetroitLions.com. October 11, 2016. ^ "Lions sign WR TJ Jones to active roster and activate DE Armonty Bryant". DetroitLions.com. December 3, 2016. 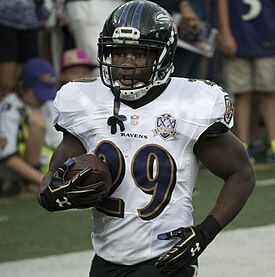 ^ a b "NFL Player Profile: Justin Forsett". NFL.com. Retrieved December 18, 2016. ^ Mason, Andrew (December 5, 2016). "Broncos awarded RB Justin Forsett off waivers". DenverBroncos.com. ^ Orr, Conor. "Justin Forsett announces his retirement". NFL. Retrieved May 3, 2017. ^ a b Florio, Mike. "Justin Forsett calls it a career". Profootballtalk.com. ProFootballTalk. Retrieved May 3, 2017. ^ Freeman, Mike. "Mike Freeman's 10-Point Stance: It's Never Too Early to Plan for Post-NFL Life". Bleacher Report. Retrieved May 10, 2017. ^ "Former Ravens Pitta, Heap, Forsett and Johnson join radio broadcast team for 2017". The Baltimore Sun. August 25, 2017. Retrieved September 16, 2016. Wikimedia Commons has media related to Justin Forsett.